Henry & Barbara: I am forwarding the article below for your enjoyment. You both were a critical part of helping us achieve our goal of a University in the City of Harrisburg, PA. It is soooooo exciting to see and be part of this huge success. I just had to share. I will always be grateful for your leadership, and that of David Schankweiler, with the Envision program. Sticking closely to the university’s missions of developing a STEM work force and bolstering the regional economy, HU now has $50 million in net assets. It went from $8 million to $80 million in annual revenue. In each of the past three years, it generated $10-million surpluses and is on course to reach $11 million this year. It has $30 million at its disposal, and its 6,500 students — 600 of them undergraduates — come from 103 countries. In 2017 it started a location in Philadelphia, about two and a half hours away. And it has plans for a program in the United Arab Emirates. In the past three years, it has begun 20 academic programs, including two Ph.D.s. In that same period, its faculty has grown from 147 to more than 400, the majority of whom, 318, are “corporate,” which is what HU calls its adjuncts. A new student union is scheduled to be ready in August, and a health-sciences building is projected to open in 2021. Barbara Groce then president of the Harrisburg Chamber of Commerce that sponsored and financed the Vision. We have all lived in the stress of “Tyranny of Urgency”. The chart below illustrates the interaction of Urgent and Important tasks. Most people live on the top side of quadrants 1 and 3 focusing most of their time on Urgent tasks that may or may not be Important. In an ideal situation, this would change to focusing on the left side of Important tasks in quadrants 1 and 2. 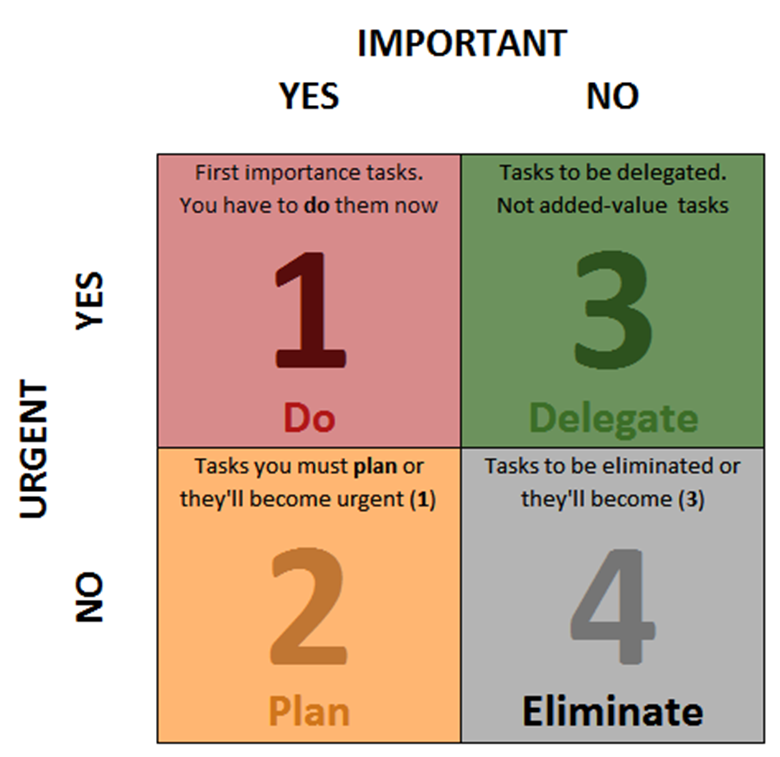 Even better would be a large portion of time spent in quadrant 2 on tasks that are Important but not Urgent. Think how that would lower your stress level. To be most effective this must be applied to all aspects of your life including job, family, recreation, personal interactions, spiritual, church, exercise, personal time, etc. The question immediately arises how can we change from a top side Urgency focused life to a left side Importance focused life. The first step is to pray that God will give you the guidance, wisdom, courage, and persistence necessary to make dramatic changes in your life. [D] Involve other family members if possible. The second step is to develop a “Life Vision”. This Vision will be long-term and what we want “To Be” not the tasks we do on a daily basis to accomplish this Vision. You may say how can I possibly know my long-term Vision in today’s fast-changing world? The answer is the Vision must be high level, conceptual and not detailed. The Life Vision provides guidance in assigning relative importance to daily tasks. I have had 3 “Life Visions” developed in 1950, 1986 and 2014. You can read about them in my January 9, 2015 post “Life Vision/Purpose” (A). Although I had a Life Vision I have not usually had detailed strategies or action steps for specific time periods in my life. In my Life Vision, I lived one day at a time (B). This probably sounds strange for a Strategic Planning Consultant (C). The difference is an organization must have many people buy into the Vision and work together to implement Strategies and Action Steps and held accountable by benchmarks. In “Tags” below click on “Life Vision” for other posts in this series that will be helpful in developing your Life Vision. The third step is to inventory your life for a week or month and identify the individual tasks where you are spending time and assigning a quadrant 1-4. Then comes the really hard part, planning ahead enough to move Important tasks from Urgent to not Urgent and also eliminating most of the tasks in the not Important column. Both of these will be harder than you think, but nothing is impossible with God’s help. By accomplishing these 3 steps and constantly Reviewing, Revising and Refocusing our daily tasks we can become a person working on the most Important tasks to meet our Life Vision. I have not always been perfect in this approach to life but I am depending on God’s greater grace every day. For how to have peace with God click here, how to have peace of God click here, and how to disciple others click here. Also see the post on “The Great Evangelical Recession” here and my personal testimony here. For a profile of Henry Luke business career through 1996 click here. For a list of Henry Luke’s 60+ Community Visioning clients click here and for my resume click here. The Disciples learned directly from Jesus, spending time together, listening, learning and doing. We don’t have the Master Teacher Himself, but we do have access to His mind through the Holy Spirit and the Gospel. And we can be available to one another spending time, reading, studying, learning and sharing the scripture… not our opinions, but God’s Word. God commands us to reach out individually, teach others and make disciples until all have heard. One2Won Discipleship stands on God’s Word, using a predetermined series of steps and scripture. Simple to use, it teaches, challenges, and builds relationships. First, allow someone to love you and be encouraged to reach out and love another. It is repeatable! Timothy’s become Paul’s and Ruth’s become Naomi’s. 1. The 25 sessions are outlined in the table of contents. 2. The program is based on Barnabas, Paul & Timothy or Naomi & Ruth relationships. 4. Each session is about 4 pages including an Introduction, Old Testament & New Testament Scripture, Observation Questions, Personal Observations & Application, Locker Room/Contemplation & My Prayers. 5. The Paul & Timothy or Naomi & Ruth come to each hour-long session with the lesson prepared & then go over it together. 6. We meet for sessions at local restaurants such as Paneras during the week. Meetings may be at breakfast, lunch, dinner or other times to meet the availability of the two participants. 7. FBC began using this process in August 2009 and it is a proven success. Made its way to the heart of Jerusalem. 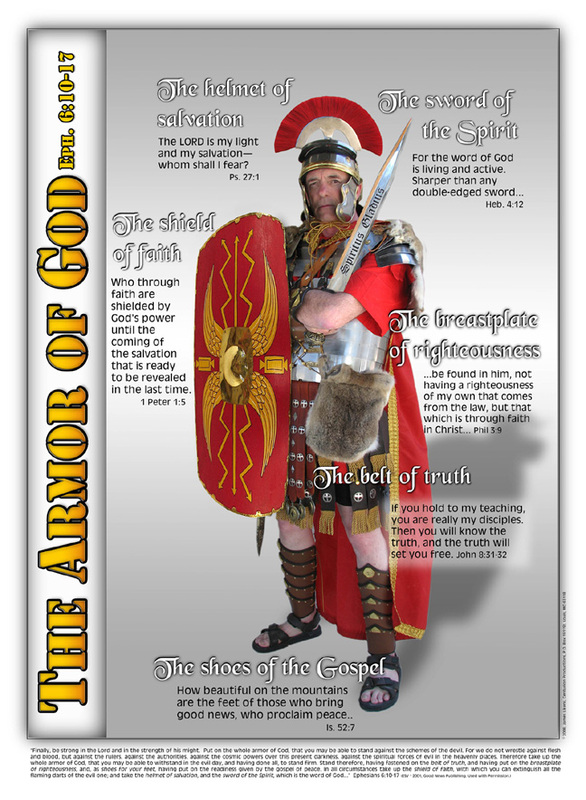 Put on The Full Armor Of God as a Warrior! Week of supplication prayer. Sunday – The Helmet of Salvation Psalm 27:1 The Lord is my light and my salvation; Whom shall I fear? Monday – The Shield of Faith 1 Peter 1:5 who through faith are shielded by God’s power until the coming of the salvation that is ready to be revealed in the last time. I now come to that part of Christian morals where they differ most sharply from all other morals. There is one vice of which no man in the world is free; which everyone in the world loathes when he sees it in someone else’ and of which hardly any people, except Christians, ever imagine that they are guilty themselves. I have heard people admit that they are bad-tempered, or that they cannot keep their heads about girls or drink, or even that they are cowards. I do not think I have ever heard anyone who was not a Christian accuse himself of this vice. And at the same time, I have very seldom met anyone, who was not a Christian, who showed the slightest mercy to it in others. There is no fault which makes a man more unpopular, and no fault which we are more unconscious of in ourselves. And the more we have it ourselves, the more we dislike it in others. The vice I am talking of is Pride or Self-Conceit: and the virtue opposite to it, in Christian morals, is called Humility. You may remember, when I was talking about sexual morality, I warned you that the center of Christian morals did not lie there. Well, now, we have come to the center. According to Christian teachers, the essential vice, the utmost evil, is Pride. Unchastity, anger, greed, drunkenness, and all that are mere fleabites in comparison: it was through Pride that the devil became the devil: Pride leads to every other vice: it is the complete anti-God state of mind. For complete chapter 8 click here.